Mi Vida Sigue - My Life Continues: Andre's Arrival in America!! PHOTO CAPTIONS: 1. 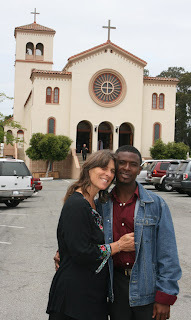 Andre and I at the church, 2. 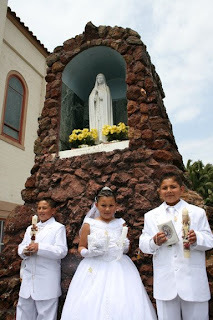 Junior, Claudia and Alexis celebrate their first communion, 3. The whole group with priest and nun, 4. 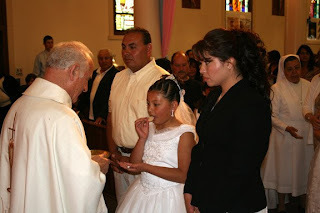 Claudia takes first communion, 5. Daniel volunteers to pass the basket, 6. 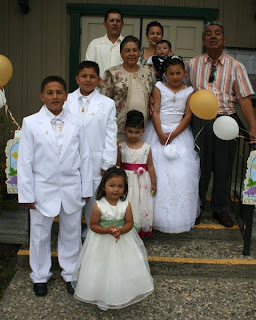 The whole family with Marisela's parents who are visiting from Michoacan, 7. 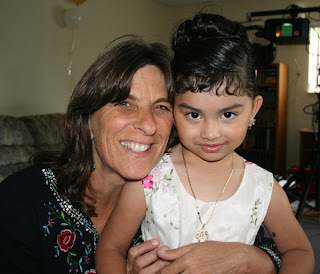 Here I am with one of the cutie cousins, 8-10. 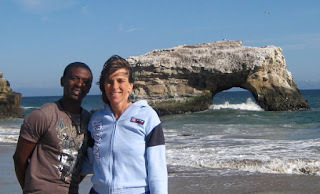 Our first bike ride together along West Cliff Dr. to Natural Bridges beach. It's official! Andre has arrived in America. I picked him up at the San Francisco airport at 11 p.m. on Saturday night. He hadn't slept much on the plane because it was a full flight and the baggage took a while to come out. By the time we got back to my house in Santa Cruz, an hour and 15 minutes away, it was nearly 1 a.m. (4 a.m. Santo Domingo time). 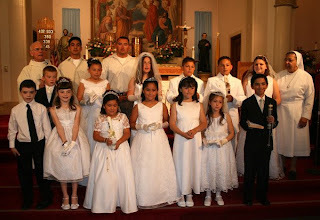 The very next day, Sunday, I swept Andre and Daniel off to a large Mexican first communion party for my friend Marisela's three oldest children: Junior, Alexis and Claudia. The mass was at the beautiful Catholic church next to the fairgrounds in Watsonville. The party was held at the community center of a trailer park in Aptos. Andre got to eat tamales, nopales, and tacos, plus drink jamaica and horchata (Mexican-style hibiscus and rice drinks) for the first time. Haitians also like spicy food, so he enjoyed it all. I was running around as the official photographer, so it was good Daniel was there to keep Andre company. When our Mexican friends struggled to speak to Andre in English, he answered in Spanish, which was a relief to them. 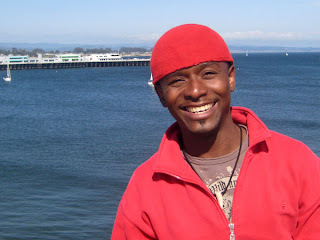 On Monday, Memorial Day, Andre and I rode bikes along West Cliff Drive to Natural Bridges State Beach. It was cool and windy, but when I asked Andre if he was cold, he answered that he was really enjoying the ride. 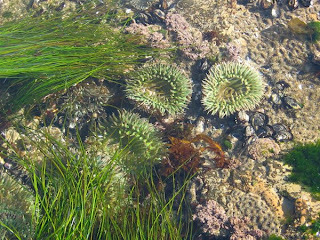 We found huge anemones in the tide pools at the beach. Later, we went up to UCSC to play racquetball. Fortunately, I have a key to the courts since everything was locked up for the holiday. Andre hadn't played in a while, so he was hungry to play. I think I surprised him with my improved game. I've been playing quite regularly while waiting for him, and I've dropped a little weight which makes me faster. Tuesday is Zumba class. Maya's ceramics teacher Wendy and her husband Blaze were there, which was an added treat. Andre looked a little lost sometimes with the dance steps, but he said he enjoyed it. We'll see if he wants to keep going, but at least now he knows what I do every Tuesday and Thursday morning. Afterwards, we went to Costco -- a new adventure for Andre. Compared to Dominican Republic and Haiti, things are so cheap in the U.S., especially at Costco. I had to pay the same price for a tiny bottle of shampoo in Haiti that you pay for a mega-sized one at Costco. 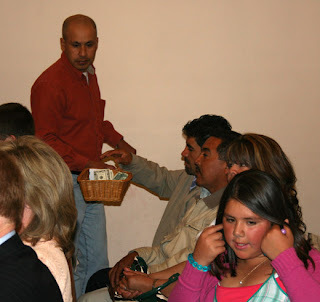 He got to sample some food, and of course he liked the Mexican snacks best. In the evening, Daniel, Andre and I went up to play racquetball again, along with a few players from the intercollegiate team. We kept switching partners, which makes it more fun. I didn't play Andre at all since we can play each other anytime. So far the weather's been nice, though a bit cool for Andre. He mentions it, but doesn't wear a jacket much, so I don't think he's suffering. I put him in touch with Marciano Cruz, who organizes soccer leagues, and it looks like Andre will be playing and coaching kids soon. Today Daniel took him along to build a huge fence. I have a feeling Andre will be too tired to play racquetball tonight. I better get to the store because I promised them some chicken enchiladas tonight.